After four title and three cover changes and 334 pages, “Abby’s Love” is live on Amazon. 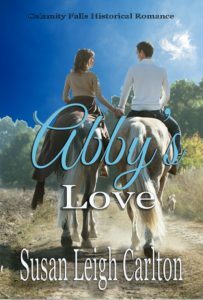 Abby’s love is a clean historical Christian Romance, set in the imaginary town of Calamity Falls, Wyoming. The timeframe is after Wyoming has become a state and before the United States enters the World War 1. After two tragic events in Abby Hartley’s life, she has become leery of close relationships. Her teaching position is not satisfying her desire to be a mother. The rejection of matchmaking efforts from her best friend almost cost her the friendship. Nathan Simms has struggled against his grandmother and her determination to arrange a match with a daughter of a high society family and her insistence he join the family business. Can they overcome the obstacles in their way and find a way to be together? Abby’s Love can be purchased by clicking here.